Wondering if you should be asking questions before getting married? Well, you should! But what are those questions exactly? And are they really that essential? Maybe you need to get your sexual needs out on the table, if you're going to promise forever and all. Or maybe you need to be very clear about your lines in the sand (non-negotiable)? 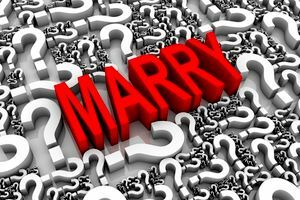 Take this quiz, answer these questions about yourself and your partner, as well as marriage needs and wants. Then get a list of questions you should be asking your partner before tying the knot!